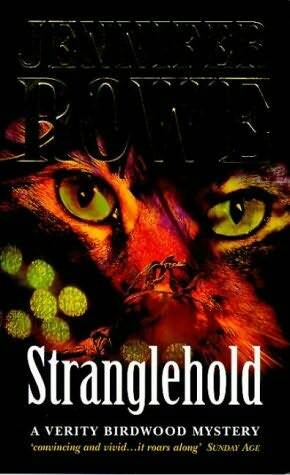 My contribution for the S round of the Crime Fiction Alphabet is Jennifer Rowe’s Stranglehold. Like most of the six novels featuring Verity Birdwood it’s an Agatha Christie inspired variation on the country house mystery. It tells the story of Max Tully; a wealthy radio host in Sydney who throws a big party for his 70th birthday at which he makes some surprising announcements. Afterwards he starts receiving nasty anonymous letters and invites Verity, a private detective as well as the daughter of his old friend and current boss, to ‘Third Wish’, his opulent cliff top house overlooking the sea. Also staying at the house are his adult children, his estranged third wife and his new fiancée. When one of them is murdered Verity must determine whether the culprit is one of the guests or a nearby neighbour. I admit I am something of a sucker for these slightly old-fashioned whodunits of cleverly constructed plots and groups of people with mysterious secrets. In Stranglehold Max Tully has some secrets from his childhood that influence his behaviour decades later and all the members of his household have secret desires or grudges or fears that come into play at some point in the story. The story is more believable than many in the genre for several reasons including the facts that the body count stops at one and the family relationships are very realistically depicted. I really enjoy Verity as a character. Although an amateur sleuth turned professional detective she’s really not at the ‘cosy’ end of the scale being a somewhat unemotional person who thinks a crime through in her head in a way that is reminiscent of M. Hercule Poirot using his little grey cells. However she’s also quite funny, if a little acerbic, and is smart enough to get away with her superior attitude. Jennifer Rowe was the first Australian writer of crime fiction that I discovered (with 1988’s Grim Pickings) and I always wish she had written more than her eight books. However, under her real name of Emily Rodda she’s been a little busy publishing around 50 books for children so I guess I have to cut her a little slack. This entry was posted in Australia, Crime Fiction Alphabet, Jennifer Rowe (Aus), memes and challenges, mini review. Bookmark the permalink. Bernadette – This seems like my kind of book!! You’ve given a wonderful review, as always, and I have just added this one to my TBR list. I can’t resist a plot with a group of people who are all suspect and all hiding secrets.. Yes Margot I think it is your kind of book – I think you’d like any of this series as they are from memory all some variation on a locked room or country house mystery.